What stocks and funds were the best in June? T-Advisor publishes its ranking taking into account the score. T-Advisor patented score provides an asset rating (bullish, neutral or bearish) based on key performance indicators and technical analysis. This entry was posted in News and tagged Asia, equity, Europe, fixed income, Investment funds, Latam, ranking, shares, USA on June 30, 2017 by Oscar Garcia. What stocks and funds were the best in April? T-Advisor publishes its ranking taking into account the score. T-Advisor patented score provides an asset rating (bullish, neutral or bearish) based on key performance indicators and technical analysis. This entry was posted in News and tagged Asia, Canada, Equities, Europe, fixed income, Investment funds, shares, Stocks, USA on May 31, 2017 by Oscar Garcia. This entry was posted in News and tagged Asia, Canada, equity, Europe, fixed income, funds, Latam, Pacific, shares, USA on May 3, 2017 by Oscar Garcia. What stocks and funds were the best in March? T-Advisor publishes its ranking taking into account the score. T-Advisor patented score provides an asset rating (bullish, neutral or bearish) based on key performance indicators and technical analysis. This entry was posted in News and tagged Asia, Canada, Equities, Europe, fixed income, funds, Latam, shares, USA on April 5, 2017 by Oscar Garcia. What stocks and funds were the best in November? T-Advisor publishes its ranking taking into account the score. T-Advisor patented score provides an asset rating (bullish, neutral or bearish) based on key performance indicators and technical analysis. This entry was posted in News and tagged Asia, Canada, equity, Europe, fixed income, funds, Latam, shares, USA on November 30, 2016 by Oscar Garcia. What stocks and funds were the best in October? T-Advisor publishes its ranking taking into account the score. T-Advisor patented score provides an asset rating (bullish, neutral or bearish) based on key performance indicators and technical analysis. This entry was posted in News and tagged Asia, Canada, Equities, Europe, fixed income, funds, Latam, Pacific, shares, Stocks, USA on October 30, 2016 by Oscar Garcia. In a post that we published two weeks ago, we reported that T-Advisor uploaded a new bootstrapping tool to forward testing assets and portfolios. We explained some ideas about how it works, but we are going to show today the results with specific examples. Data provide that the maximum possible loss is 25.14% in 4.5 years, but after this point, the poorest result goes up and becomes positive 16.6 years later. Expected probable returns in 20 years are 296%, what means a 15% annually. What does it mean? Investing produces profits in the long term. 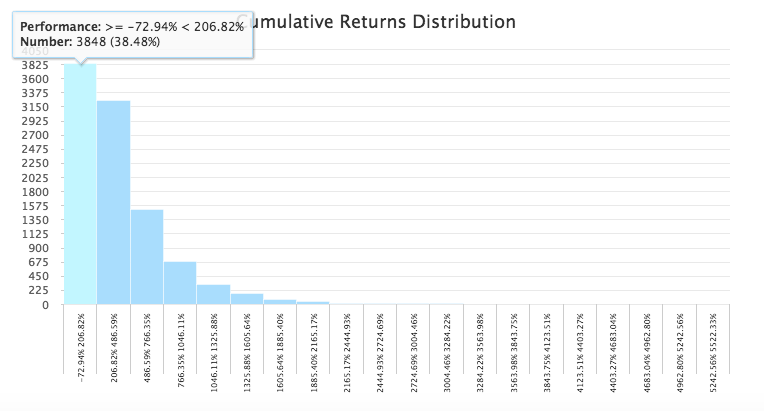 The cumulative returns distribution shows also that the highest probability is that S&P performs between -72.9% and 206.82% in around the 40% of the cases. The maximum possible loss is 17.26% in 5.2 years and it reaches probably the breakeven near the 20th year. Expected probable returns in 20 years are 113%, that means a 5.6% annually. In this case, fixed income performs lower than stocks, but possible losses are also less. 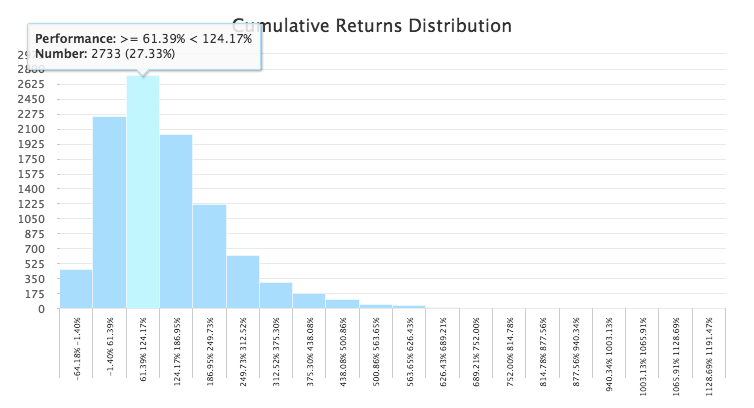 The cumulative returns distribution shows also that the highest probability is that the fund performs between 61% and 124% in around 27% of the cases. There is also a probability of 22.5% of obtaining between -1.4% and 61%. If we compare this figures with the S&P bootstrapping, the range is shorter, that means, it is less volatile. Investing performs positive in the long term and probably with higher returns than other products. People should forget to become rich in a year when they invest. Results are clear only in the long term. We have to consider shares and funds investing as an asset amongst other ones. Bootstrapping provides ONLY probabilities, NOT certainties. When we forward test, we obtain signals, clues and ideas about the possible trends. That is why to read carefully and analyse quietly the results. At the end, investing is a kind of job that needs a very important value: patience. This entry was posted in Discover and tagged bootstrapping, fixed income, Probability, S&P on October 13, 2016 by Oscar Garcia. Risk required: risk associated with the return required to achieve the investor’s goals from the financial resources available. Risk capacity: the level of financial risk the investor can afford to take. Risk tolerance: the level of risk the investor is comfortable with. The three components are different faces of the same process. For instance, you can be very aggressive in investments (risk tolerance), but without very much money to invest, because you are very engaged with different kind of expenditures, as a mortgage or children (risk capacity). Investment authorities in different countries have developed several standards to test the risk profile for individuals and these tests are required to banks, wealth managers and financial adviser with their customers. These tests ask for the experience, the knowledge and the strategy. An individual with low knowledge and experience in investments cannot begin with complex products, because the risk of losing a huge amount of money is very high. Risk profile means that individuals and their investments have to agree the same standard. From this perspective, the usual range comes from very conservative to aggressive. Usually, conservative investors prefer a lower performance if their portfolios suffer less changes and tend to keep their investments for a long term. Aggressive investors choose always a higher performance, although the assets suffer more changes and they have more probability to loss their money. They also look for short or medium-term investments. 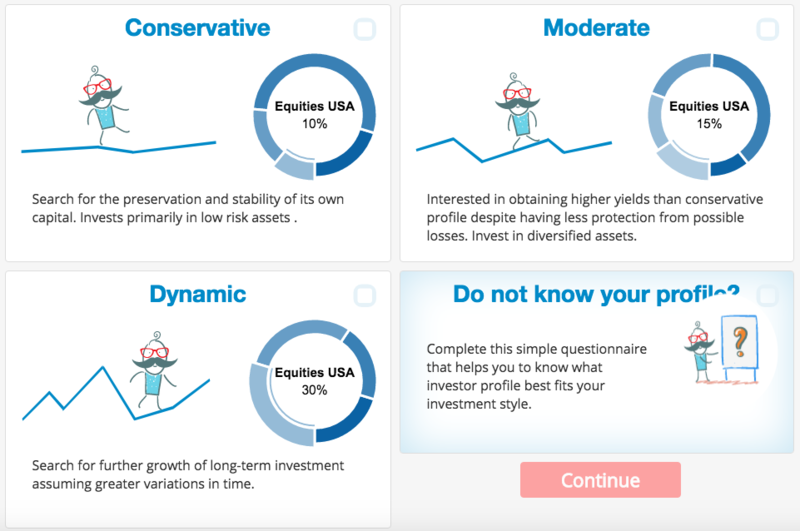 What are the recommendations for conservative risk profiles in order to build their portfolios? Fixed-income assets (bonds, fixed-income mutual funds), cash, deposits and, if they are a bit biased to equities, the best are liquid stocks that pay dividends. On the other hand, aggressive profiles will look for equities (even in risky countries, as emergings or frontier), short-term assets and derivatives. They can provide high returns, but you can also loss everything. What is the main recommendation over the ones above? Every investor has to honest with himself to accept his profile. If you lie yourself, you can be at a very high risk in investments. That is why you have to fill in a risk test, before you put your money in any adventure. This entry was posted in T-Advisorpedia and tagged Equities, fixed income, Portfolio, Risk capacity, Risk profile, Risk required, Risk tolerance on September 7, 2016 by Oscar Garcia. What stocks and funds were the best in July? T-Advisor publishes its ranking taking into account the score. T-Advisor patented score provides an asset rating (bullish, neutral or bearish) based on key performance indicators and technical analysis. This entry was posted in News and tagged Asia, Australia, Canada, Equities, Europe, fixed income, funds, Latam, shares, Stocks, USA on July 29, 2016 by Oscar Garcia.